So you already buy all your groceries based on whether or not they participate in Box Tops For Education (BTFE), you clip and save religiously and are still wondering what else you can do? Well have you been to the BTFE website lately? Go ahead and look, I’ll wait…. …….wow, have you ever seen a messier keyboard…and look at that ancient mouse, I wonder if it’s an original…OH LOOK YOU’RE BACK! Where was I? Oh right, so I’m sure you saw that you can register with your school’s information and get all kinds of additional goodies. Well in case you missed it…how about being able to see just how much your school has raised so far? Is that cool or what? If the number isn’t to your liking then you can enter one of the many regular contests. Each month BTFE gives away a big chunk of free box tops to 10 or so lucky schools. You can enter daily and since all your info is saved it only takes two clicks. First agree to the rules (does anyone really read the rules?) then ‘Enter.’ Let me tell you that’s a lot easier on your hands than cutting out 5,000 box tops. 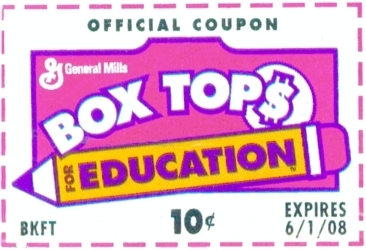 If you like the whole idea of getting box tops without cutting you can earn ebox tops when you shop online at place like: Land’s End, Expedia, JC Penney, Office Depot, Vista Print, Cabela’s, Justice and Barnes & Noble. Simply shop through the BTFE site and your school will get a certain number of ebox tops for each $10 spent. You’ll even get 10 bonus ebox tops when you earn your first 100. You can even take the sting out of those annoying school supply lists by using My Class Essentials to make all your purchases. Teachers can upload their lists to the site and whatever you buy will add to your ebox tops total. Does your box top coordinator do a fantastic job? Of course they do. So nominate them for the Hamburger Helper Helping Hand Coordinator of the Year award and if they win they get 5,000 bonus box tops plus four runner ups will receive 1,000 each. Do you eat Old El Paso tacos and like online taco related games? Who Doesn’t? …there now you have no excuses. So now please allow me to takes this time to pat myself on the back for performing this admirable service. Single handedly breaking down all the reasons why you should join Box Tops For Education like no one else could possibly…what…there’s a whole video at the site that explains why you should join? I suppose you’ve been watching that this whole time and I’ve been talking to myself. Is this thing on? Well if you stuck through all this I thank you…now go watch the video for yourself…and ummm you might want to clean up that keyboard it’s kinda gross. This entry was posted in Books, fundraising, Helpful Advice, Humor, Kids, Local, saving money, school and tagged box top coordinator, box tops, box tops for education, BTFE, contests, ebox tops, fundraising, printable coupons, school supplies, schools, sweepstakes, teachers. Bookmark the permalink. 2 Responses to Box Tops For Education: Why Join? I can tell you first hand that Box Tops for Education works! Being co-chairman for my kid’s elementary school I collected at least 200 trillion box tops. Each classroom had an empty General Mills cereal box. At the end of the month my friend and I would go around and collect them, count them and send them in, accumulating points each time. Of course, flyers would go out every now and then reminding families to save and send them in with their children. I don’t remember what we redeemed those box tops for (it’s been over 16 years) but we did make a difference.